The farm boy from Narrows, GA (nothing there now), raised in Royston, GA, chose a path his educated and somewhat strict father did not desire for him. Pro sports were not what they are today. A career might just pay the bills. His career almost did not take off. His initial minor league efforts in Augusta were quickly halted by a manager that elected another for his position after a few games. Upon his release, he found a team in Anniston, Alabama in a semi-pro league -- the Southeastern League. He performed admirably. With a little self-promoting and a change of manager in Augusta, was given another chance in the Sally League. Augusta's new manager George Leity had a profound impact on young Cobb. He told him about his great potential but with caution to focus, work hard and to quit goofing around. He took that advice. He moved up in quick fashion. He played in Detroit 22 years (5 as player/manager) and his 2 final years in Philadelphia under Connie Mack. He succeed in Detroit despite one of the league's weakest and cheapest owners, Frank Navin. Controversies surrounding Cobb seemed to be a direct result of his toughness, unwillingness to back down, and his extreme competitiveness. He probably had a cocky personality and a different sort of sense of humor. Jealousy by others of his tenacity contributed to his reputation. A dirty player he was not. Cobb knew how to play the game. He was a student, a journeyman. He knew the fundamentals like no one else. Whether is was bunting, sacrificing, hitting in situations, base running, defending, he knew his craft. He was pretty good at teaching it also. Cobb was financially very successful, a multimillionaire many times over. 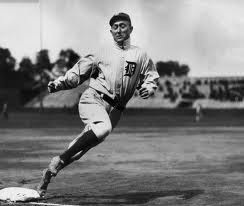 His Cobb Memorial Hospital (in memory of his parents) and Ty Cobb Educational Foundation are still operating today. His toughness and his chip-on-his-shoulder demeanor made him great on the field, perhaps not as great off. He died a lonely man, but very accomplished. In his autobiography, My Life in Baseball -- the True Record, he shared some interesting thoughts on baseball. He was of the Golden Age of Baseball and/or the Dead-Ball Era, long before the home run became the standard. He was a purist, believing in manufacturing runs. He was not a fan of the evolution toward the long ball. I agree with him. Baseball is more enjoyable watching strategy and execution. Many of baseball's true skills have been lost. Few know how to bunt, sacrifice, run the bases, throw to the right base, hit cut-off men, hustle. Those players that shine here are the ones I enjoy and appreciate. The home run hitter is all or nothing, striking out way too often. Baseball has become more selfish, less team focused. Tough to argue with this team.